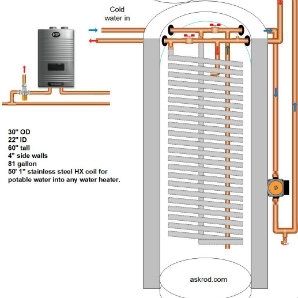 Today, as part of our ongoing series of basic solar designs, we look at a drainback system using an efficient solar storage tank and a tankless water heater as backup. This design is fairly uncomplicated and is, perhaps, the least costly system for residential applications. For all its simplicity, it delivers freeze and overheat protection with water. It also features low heat loss. The tank is the solar storage and the drainback tank combined. The hot water storage tank I’m using in the drawing is made of expanded polystyrene (EPS), which has an insulation factor of about R5 per inch. Dimensions of the tank are 60 inches in height and 30 inches outside diameter, with 4-inch walls. Usable Btu storage is 81 gallons, which when filled with solar energy up to 160 degrees equals about 67,000 Btus of energy. The system has very few components — basically the storage tank, pump, controller and collectors. The tank contains a 50-foot 1″ HX coil. Potable water is drawn through the coil, picking up heat from the contents of the tank. The backup water heating is located after the coil exits the tank. A tankless gas or electric water heater works well as a backup, or this could be connected to any existing water heater and used as a preheat design. This system is an excellent choice for the HTP Hydra Smart tankless water heater. That is the tankless water heater I’ve used in the design drawing. For more information on this advanced, modulating tankless, click here. Like other drainback designs, all plumbing must be sloped from the panels for complete drainage. Here’s more general information on how tankless water heaters work.